Three days ago, portions of Warren’s Fifth Corps ventured well out to our West and ran headlong into Mahone’s Division of Rebels. Just to get astride the Weldon Railroad at all was a wet, dirty chore in driving rain and thick with Virginia mud. As so often happens, the weather improved just in time for the killing to resume. I found myself far too forward; well up with the 15th Battery, New York Light Artillery. These able New Yorkers soon had a whole brigade of Rebels madly charging our lines, and with as good a rendition of the Rebel Yell as ever I have heard were soon among us. The 15th’s captain bravely fought his guns which did much mortal work on our enemies. The picture was one of total chaos, with nearly every single man on the piece nearest me dead or wounded. I had the thought to run powder to the gun but felt something hit my leg near my left ankle, and I too was down but not so seriously wounded to fail to witness the extraordinary events which followed. The 6th Wisconsin was what little infantry supports we had immediately at hand. The captain of the 15th New York Light somehow learned that there were some old Battery B men in the 6th’s ranks and shouted “For God’s sake send them to my guns!” It all happened so rapidly that it was difficult to take it all in. When in the middle of a fight the mind plays tricks. Veterans all say that the only way to slow the carnage down enough to fight is to shut out everything else. They must have, for then that gun was manned and firing well aimed shots at a retreating enemy, broken by the 15th guns, and the 6th, and 7th Wisconsin regiments, the 24th Michigan, and 19th Indiana of the old Iron Brigade of Westerners. Providentially, the brigade provost guard of just 75 men of the old 2nd Wisconsin Volunteers plugged a key gap in our line at the very last extremity. So much that is a soldier’s, and by extension a correspondent’s life with the Army is just dumb luck, or providence that saves or ends men’s lives in war. My wound was not nearly so serious as surgeons first believed. A piece of shrapnel from any number of Rebel guns firing on us opposite our line simply embedded itself in the fleshy part of my lower left leg lengthwise, not breaking any bone or severing a major artery at all. So here I sit in front of the Globe, leg bandaged and my wound beginning to suppurate, with what’s left of the 15th, and the 6th Wisconsin Light Battery that has come up to reinforce us since last night. Just now the Brigade Provost Guard, the 2nd Wisconsin, returning from sending our prisoners to the rear, came into this little crossroads most smartly and right quick with the quickstep. They’ve bivouacked just the other side of a stone bricked general store with empty shelves, and the owner long run off by our approach. A troop of cavalry as a scout just followed and are further up forward seeing what mischief awaits us. 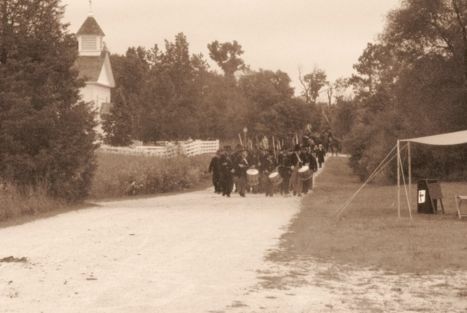 Lt. Ryan Schwartz of the 2nd Wisconsin Volunteers told me they’d have come up much faster but some as yet unidentified officer with no connection to this particular brigade sent them due north right at Petersburg before the mistake was uncovered, and they countermarched to our aid. Most amazing here are the little children that have come out from various homes and buildings, even an old smithy just opposite of where I sit. They were so hungry that they greedily took broken pieces of hardtack. The 6th obtained some fresh eggs in the creative fashion veterans do, and boiled them for our dinner here this noon. A kind lady gave me some soft bread and hams no less, to speed my recovery. There was enough for the battery and even a few men of the 2nd. She is a loyal Unionist rejoicing at seeing our national colors again for the first time in three years. I’m under a tent fly as storm clouds gather. I’d sleep in the tavern if it were not the scene of so much suffering of the many wounded and dying men from yesterday’s sharp fight. P.S. Cpl. Horace A. Ellis of the 7th Wisconsin volunteers captured the battle flag of the 16th Mississippi in yesterday’s struggle. Captain Dailey, commanding the 2nd Wisconsin, seized another and was shot by the enemy commander when he refused to give it up. There are hopeful signs that he may recover. 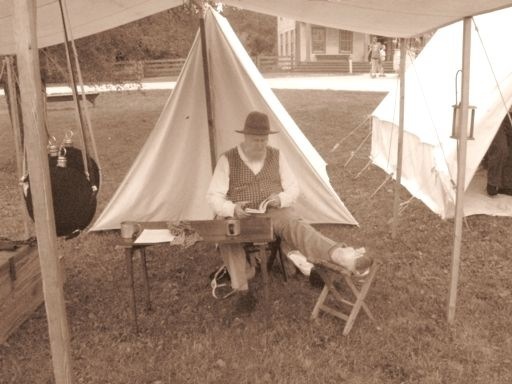 This entry was posted in Education and tagged 2nd Wisconsin, 2nd Wisconsin Volunteer Infantrry Association, 6th Wisconsin, American Civil War, Civil War Renacting, Living Historians, New York Light, Petersburg, struggles for justice, Thomas Martin Saturday, Virginia, War Between the States, Wisconsin, Wisconsin Volunteers. Bookmark the permalink.